Baumer is enhancing the LX series with 2, 4 and 25 megapixel cameras with integrated JPEG image compression and frame rates of up to 140 fps. With the GigE cameras, you can save all down the line: from bandwidth through CPU load to storage space – this simplifies the system design and reduces integration costs. Serial production will start in Q4/2018. These new models are particularly well suited for applications that require long image sequences, but do not have to transfer and save the complete original images, for example in process monitoring or motion analysis in sports. The JPEG compression rate is configurable so that the image quality can be adapted to meet the needs of the individual application. Data reduction in the range of 1:10 to 1:20 can be achieved. 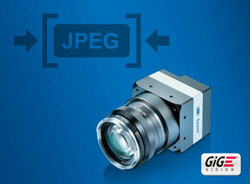 The JPEG image compression takes place directly in the FPGA of the camera, which offers many advantages. A reduced bandwidth like that of Gigabit Ethernet is sufficient for the high-speed transmission of high-resolution images. This allows a cost-effective and flexible system design. At the same time, the PC-based image processing system is relieved of CPU-intensive algorithms for image compression, so that a PC is sufficient even for operation with multiple JPEG cameras. To bridge longer distances, it is also easily possible to use a GigE switch. Compared to the transmission of full frames, applications also benefit from reduced storage space requirements, which cuts costs for hardware as well.